Domenica Bertolusso and Chef Beppe Montanaro, the proud owners of TartufLanghe, have been purveyors of the coveted Piedmont Tartufo since 1968. And how sweet it is that they’ve branched out to chocolate. 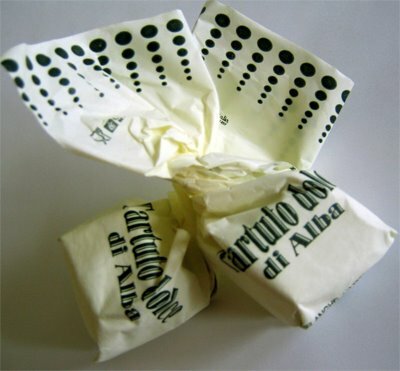 Like the first ever chocolate truffle, Tartufo dolce d’Alba is the chocolate interpretation of its namesake. True to the classic, the truffle is fashioned into an irregular shaped nugget to appear as if it had been plucked straight from the earth by one of those indispensable pigs. Beneath the dusty layer of dark brown cocoa powder is a smooth ball of bittersweet Italian chocolate bursting with sumptuous chunks of rare IGP (Protected Geographical Identity) Piedmont hazelnuts (among the best variety in Italy). And the great news is that for a few Euro, you can have the authentic tastes of Piedmont imported straight to your door.